David Grosz, President of Artifex Press, will present at a panel entitled "Perspectives on Publishing," which provides insiders’ insights into the process of finding a publishing partner and preparing a manuscript or digital content. This event takes place on June 13, 2015, at 2PM at the Museum of Modern Art, New York in the Lewis B. and Dorothy Cullman Education and Research Building, Celeste Bartos Theater. 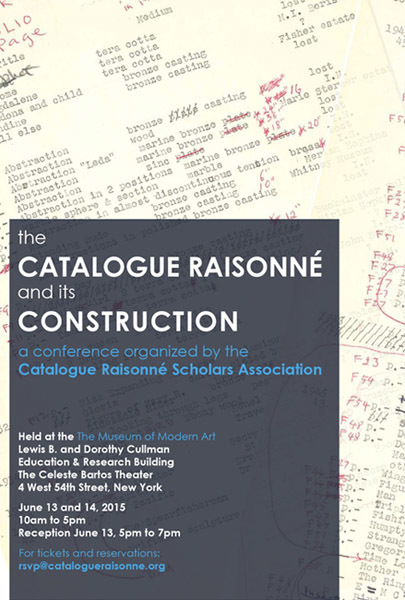 Béatrice Gross, Editor of the Sol LeWitt Wall Drawings Catalogue Raisonné, will present at a panel entitled "Emerging Forms and Formats," in which panelists will present on the challenges and rewards of publishing on new platforms and researching artists working in non-traditional media. This event takes place on June 14, 2015 at 2PM also in the Celeste Bartos Theater.